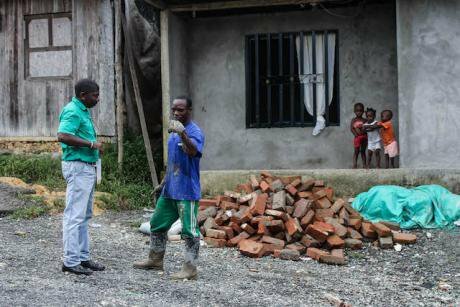 Social Activist Temistocles Machado supervises some works at the Comuna 6 neighbourhood in Buenaventura, Colombia, just weeks before being murdered. Image: Elisabeth Otálvaro, vía Pasifista!. all rights reserved. Before he was killed last Saturday January 27, the Colombian activist and community leader Temistocles Machado knew his life could be in danger. Machado was one of the most prominent leaders working to defend collective rights, including the right to land, in the city port of Buenaventura in the Colombian Pacific Coast—the country’s poorest region. Last year, the people of Buenaventura and Quibdo held a strike to protest the government’s failure to provide funding for infrastructure, health, education, and other essential public services. An expert on these broken promises, Machado was among the leaders of the strike and was also known as a resource for information about land titles and public services. His personal records were so vast, so important, that the Historical Memory Center—a state institution that preserves records and documents about Colombia’s armed conflict—chose to digitize and protect it. 105 human rights defenders and social activists were killed in Colombia in 2017, the first year with a peace agreement in place. This number is in stark contrast to the national murder rate, which in 2017 was the lowest since 1975. But Machado himself was not protected. Instead, his name has been added to a growing list of social leaders murdered in Colombia. Explanations, interpretations and excuses for this vary. But the hard data is clear: According to the latest report from Front Line Defenders, 105 human rights defenders and social activists were killed in Colombia in 2017, the first year with a peace agreement in place. This number is in stark contrast to the national murder rate, which in 2017 was the lowest since 1975. One out of every three activists killed around the world last year were killed in Colombia. For Colombians, this brings a deep and unsettling sense of deja vú. People remember and fear the return of even darker times, such as the systematic killing of leftist activists of the Patriotic Union, a political party that was ultimately eliminated by an alliance of drug cartels, paramilitaries, and security forces in the 1980s and 90s. Even closer are memories of the massive killings perpetrated by the Autodefensas Unidas de Colombia beginning in the late 1990s and continuing until its surrender in 2005. Even former FARC members are exposed to serious violence: By the end of 2017, 34 had been killed, according to the latest report from the UN Verification Mission. In certain areas—like the Pacific Coast region, which has a significant indigenous and Afro-descendant population—violence is still a clear and present problem. And it is more difficult to assign responsibility for recent attacks. The dissidents of FARC still operate actively in the South West, among other places. Peace talks with the National Liberation Army (ELN), another guerrilla group, have broken down, creating the possibility of more violence. Criminal gangs and paramilitaries seek to suppress social movements and instil fear in whole communities. Impunity only makes these problems worse. Though the general attorney’s office has appointed special prosecutors and President Santos has personally pushed for more protection for threatened leaders, very few cases of violence against social leaders reach the judicial stage. A state agency—the National Protection Unit—provides physical protection to more than 6,000 people in the third quarter of 2017. But in rural areas, protection is hard to provide and maintain. And some social leaders reject state protection because they feel it is at odds with their role in the communities they represent and defend.Even amid such challenges, Colombia has made significant progress. State institutions have become more effective in confronting violent crime, and prosecutors and judges have more meaningful protections than before. Despite complications, the peace agreement with the FARC promises to be a turning point in Colombia’s history, opening a window of opportunity. Civil society is not only more resilient, but has become more engaged and influential in policy-making. Despite complications, the peace agreement with the FARC promises to be a turning point in Colombia’s history, opening a window of opportunity—especially for the territories most affected by the internal war—and offering a promise of protection to social leaders and organizations, many of whom had been violently silenced. Some local analysts say that the new wave of violence against activists might be a result of the vacuum left by the demobilization of FARC, and the fierce competition for control of drugs, illegal mining, and other criminal activity that followed. Others point to the complicity of local authorities. One thing is clear: Protecting human rights defenders and social leaders remains an uphill battle in Colombia. Beyond the protection provided by the state, a number of civil society organizations are working to prevent violence, with the support of international groups including Protection International and Front Line Defenders. Their efforts reinforce the importance of staying optimistic about the possibilities created by the peace process, and being active in efforts to advance it. As we do, it is equally important to stay vigilant about the lives of heroes like Temistocles Machado.